Early 1930's. By this time Simplicity has adjusted their marketing approach slightly. 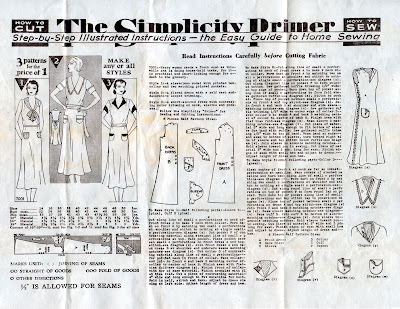 While still implying economy (3 patterns for the price of 1) they seem to be focusing on ease of use by adding an instruction sheet called the Simplicity Primer. Note also that they emphasize that the pattern is Hand-Cut; the practice of producing pattern sheets as laid out on the fabric (see Smock pattern 160) has been abandoned. If you must leave the house while wearing your house dress, you won't feel ashamed of doing so, knowing you're nicely dressed in your smart Simplicity frock. The sleeveless version would be appreciated by women living in warm climates in this era before air conditioning. I made up version 2 in a 1930's reproduction cotton I'd gotten on sale. I left off the sleeve cuffs and I've no idea where the tie belt is. I wear this dress a lot, even though I find the v-neck a tad low. The neckline on view 3 would probably suit me better. The actual bust measurement is 46". (Note that the pattern was offered in sizes up to a 50" bust. Utilitarian patterns like house dresses were more likely to be offered in larger sizes.) This dress is very easy to iron. I am deeply deeply envious;) I adore the older housedress patterns and have yet to find any in my size. I love your choice of fabric... it was a real treat to see the dress made up! Thank you! I think we can learn a lot from making up vintage patterns in terms of ideas of fit and style and the variance between contemporary fashion illustration and clothing reality. The sewing experience itself is also instructive, revealing the acceptability of piecing, a remarkably late use of gussets in women's shirts, the assumption that everybody knows how to cut their own facings or bias bind a collar. I'm always learning new things! You are ever so much more knowledgeable than I! 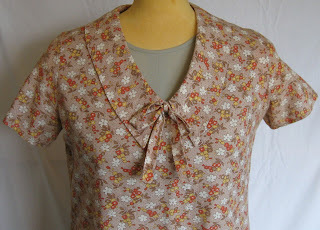 I have tried a few vintage patterns, and as you say it is a learning experience in itself. I'll never forget making a child's dress, thinking I had it all cut out, then reading "make shaped facings" in the directions. Make my own facings? I never had a clue about such things (and really still don't I am embarrassed to say). A very useful reference when working with vintage patterns is vintage sewing books. The pattern companies all produced them; the Butterick books in particular are very good. Many of the others were high school or college level Home Economics text books. They show up on ebay now and again, but here's a tip: if you find a title on ebay in which you're interested, look it up in www.bookfinder.com. Frequently you can find the same title offered for sale for far less than an ebay item when bidding gets heated. I just found your blog while searching for 1930s patterns and I absolutely adore this dress! Lovely! Thank you. I think the 1930's produced some of the most beautiful clothes ever made. I think that's a large part of why I like 1930's films; Fred and Ginger, Nick and Nora, and anything directed by Hitchcock - there are always wonderful clothes in them. Thanks so much for that tip on obtaining sewing books at a relatively reasonable price. I have a kind of a "thing" for vintage homekeeping books... and sewing books in particular, and yes, the prices can get terrible high on Ebay! It's a shockt to realize that women used to distinguish between day wear for the home and daywear for "town." I remember older ladies in our little farming town putting on a good dress, a hat and gloves to pick up some thread and notions at Woolworth's. (And I'm not ancient by any yardstick.) Now everyone goes out in anything, including pyjamas and lingerie. When I was very small my mother would put on a nice dress, lipstick, and a hat to go into town to shop. The hat-wearing ended with the Kennedy presidency. 1987 was the first time I saw people dressed in jeans or shorts going into to reasonably nice restaurants; I still remember how surprised I was. My mother makes fun of my [severely] outdated clothing. I adapted a commercial Simplicity shift dress a couple of years ago and use it for housedresses. The results are almost identical to 7001. That's pretty amazing - right down to the shape of the collar. Well, a good idea is a good idea, no matter when it was hatched. Lovely dress! I love the idea of wearing comfortable, practical housedresses. There is still a pretty good selection of plain, pull-over dress patterns produced by the major pattern companies, and even more options when you look into the offerings of some of the smaller pattern companies. 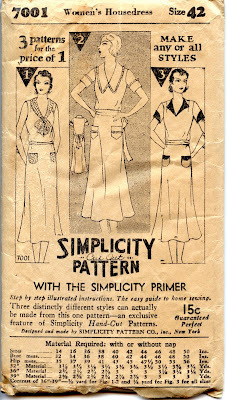 You'll note one of the features of the vintage patterns is that they are very easy to iron - not a lot of shaping or pleats. If you like the vintage look, reproductions of cotton print fabrics from the 1920s and 1930s are commonly found in quilting shops or at reproductionfabrics.com. I usually wait for a good sale and stock up. I recommend french seams so that your dress will hold up well after repeated laundering; once you have an article of clothing you really like, you want it to last as long as possible. LOVE this dress! So simple, classic lines, pretty fabric, and looks very comfortable...thank you for sharing!